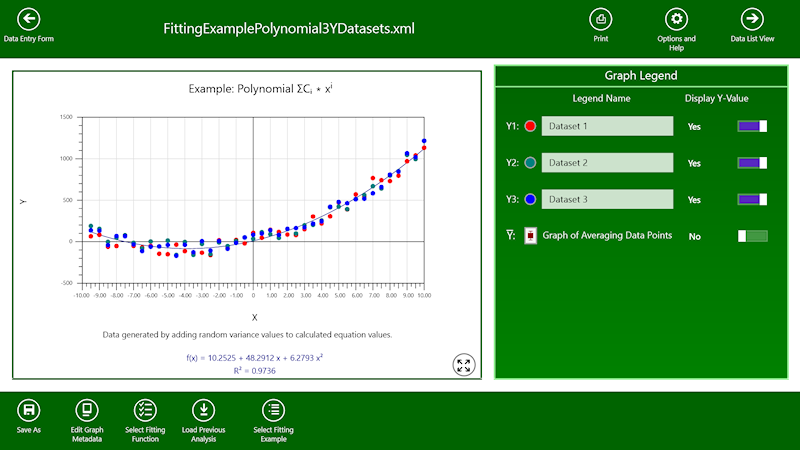 This Windows 10 and 8 Store App performs linear least squares regression fitting to obtain a line of best fit for data. It is designed for scientific and business small datasets of less than 500 points, but it can handle larger. 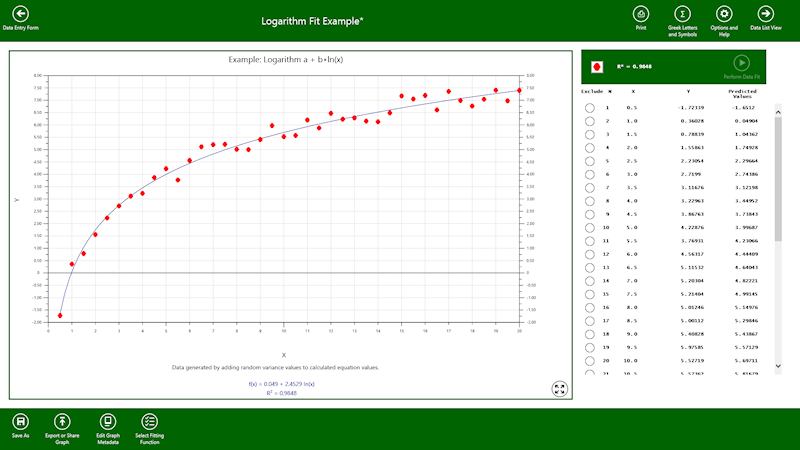 Currently, the available fitting functions are Linear, Exponential, Logarithm, Power and Polynomial of order up to 10. It determines the fit line equation, regression R² value, graphs the original data with the fit line and lists the original data with predicted values. Data can be easily entered and edited manually or loaded from CSV files (tab, space or comma separated x and y values). The original data and results can be saved to an XML file for reviewing and exporting. 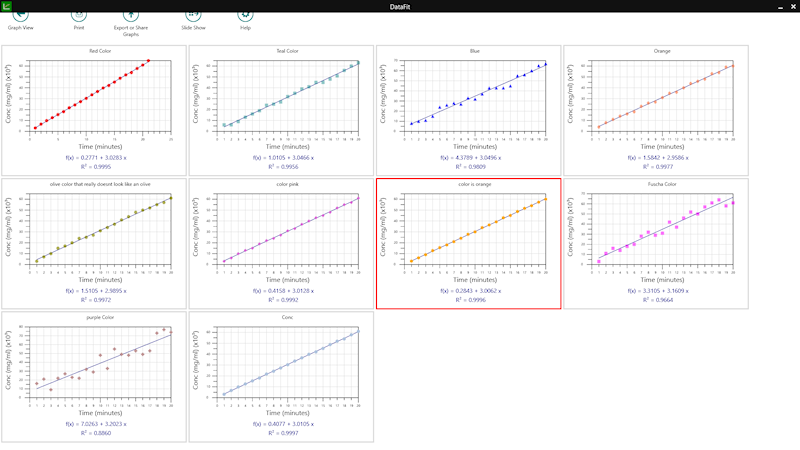 The graph of input data with fit line and its fit equation, R² value and tabular results can be printed. 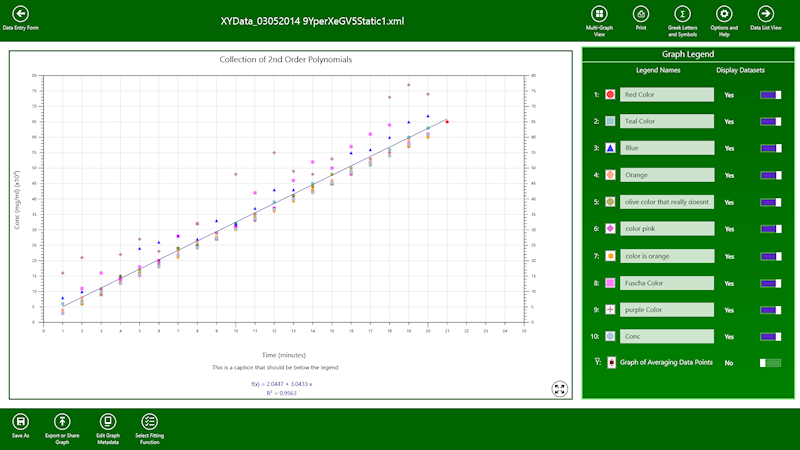 Data Entry view showing 3 datasets, 2nd order polynomial selected, title and caption entered along with labels for the x and y axes. 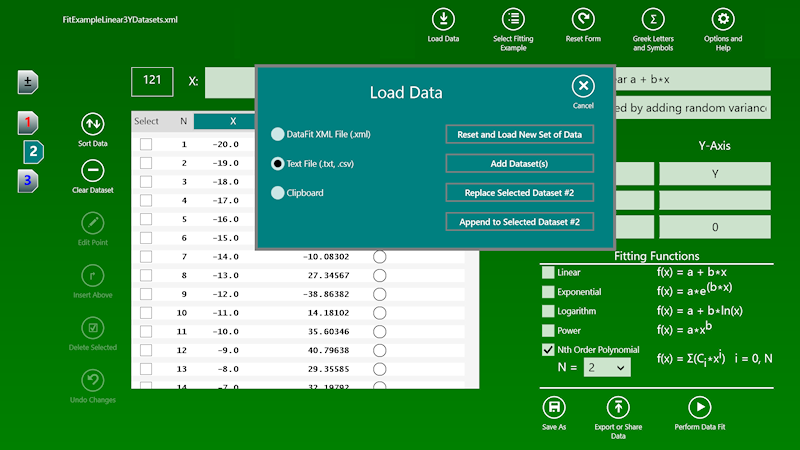 It also shows the load popup view for loading new, additional, replacement or appending data. The popup also shows that the data can come from a previously saved xml DataFit file or from a text file or the clipboard. There are buttons for saving the data or exporting it. Graph view showing a plot of three datasets with its 2nd order fit line. Toggling on and off a dataset forces a recalculation of the fit line using only the datasets being displayed. Graph view showing an exponential fit to a set of data. Graph view showing an log fit to a set of data. Graph view showing a linear fit to 10 datasets. Multi-graph view showing each of the above datasets in its own graph with its own fit line. Send mail to info@BioXing.com with questions, comments or requests for information. Copyright © 1999-2017 BioXing. All rights reserved. Use or reproduction without authorization from BioXing is strictly prohibited. By using this site you accept its Terms and Conditions.